​​AUSTIN – A San Antonio-based developer is planning a skyscraper in d​​​owntown Austin that would soar 850 feet high which, if built, would make it the city’s tallest building. The proposed project would be built in the block bounded by West Sixth, West Seventh, Guadalupe and San Antonio streets, now home to an Extended Stay America hotel. The tower as currently designed has 62 stories, although ultimately there could be more, possibly up to the “mid-70s” range. 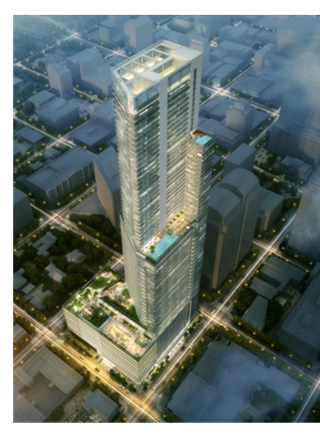 The tower would have more than half a million sf of office space, roughly the same amount as in the Frost Bank Tower at East Fourth St. and Congress Ave., plus more than 300 luxury apartments, as well as ground-floor retail space. The firm will be submitting plans for the project to the City of Austin in the near future, and anticipates breaking ground in nine to 12 months. The entire project is expected to take four years to complete. ​​Check out all mixed-use stories across Texas.